Food. If there’s one topic that is heard just about every day in November and December, it’s the topic of food: Thanksgiving feasts, pies, desserts, holiday parties, the 7 fishes of Christmas, sweet and savory pastries, mom’s string bean casserole, grandmother’s secret recipes, finger foods, formal foods, and favorite foods. But there are some who literally can’t get enough of just plain food and face bare cupboards all throughout the year. It was those thoughts of empty cabinets that spurred the Memorial Congregational Church (MCC) of Sudbury to team up with other churches in the area to donate 37,500 meals to area food pantries – a number honoring MCC’s 375th anniversary. Rev. Tom O’Brien, pastor of MCC, brought the idea to the Sudbury Clergy Association. He suggested that a joint event with many congregations in town would have even more of an impact for struggling families in the area. The group agreed and decided to pair up with Rev. Matthew Martin of Kids Care, the New England arm of Outreach, Inc. to organize the event because they had worked with the organization in the past. Kids Care New England specializes in raising funds and organizing events where Kids Care Meals are packaged. These meals are nutritionally balanced and highly requested by local food banks, pantries, churches, and other food relief facilities. Through online and printed communication as well as messages from the clergy, over 250 people volunteered and many others donated funds. Almost $10,000 was needed to provide the packets of nutritional macaroni and cheese or rice and beans that feed up to six people -- at a cost of only 25 cents per serving. Over a seven-hour period, volunteers rotated into one of twelve spots on each of four assembly lines. 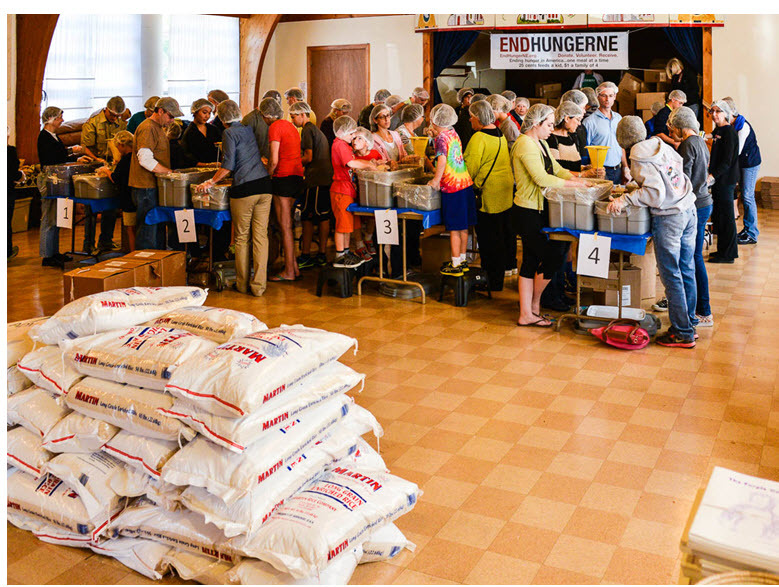 In shifts of an hour or more, individuals from eight Sudbury congregations joined others who heard about the event, helped scoop dry goods, weighed and sealed bags, and then packed and lifted boxes. Throughout the afternoon, donations continued to be collected. By the time it was over, the goal had been reached and surpassed. In total, 40,218 shelf-stable meals were paid for and put together, making it the largest Kids Care event in Middlesex County. The meals were sent to ten area food pantries where they were made available to families who struggle to put meals on the table. “It was truly and ecumenical and interfaith event as members from MCC worked alongside those from other congregations and members of community organizations,” said O’Brien. Those involved included: Congregation B’nai Torah, Sudbury United Methodist Church, First Parish of Sudbury (UU), Our Lady of Fatima, St. Elizabeth’s Episcopal Church, St, John Evangelical Lutheran Church and Sudbury Presbyterian Church as well as Cub Scouts Den 17, Boy Scout Troop 61, St. Mark’s school in Southboro, as well as many other individuals from Sudbury and beyond. "This was a great experience for MCC on so many different levels," O’Brien continued. "Not only were we able to live out our calling as disciples of Jesus to feed the hungry, we were also able to join together with our neighbors and recognize that it doesn’t matter how, why, or where we worship the Divine, we are all called to help." For more information about Kids Care, please visit EndHungerNE.org. You can contact Rev. O’Brien at the church at 978-443-3885 or pastor@MCCsudbury.org or visit their Facebook page at https://www.facebook.com/mccsudbury.